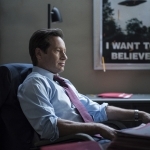 The nature of the relationship between Mulder (David Duchovny) and Scully (Gillian Anderson) has always been the “true believer” and the “skeptic”. This is the focus of this week’s case. A pair of stoners (the male being Tyler Labine of Tucker & Dale vs. Evil) out discussing werewolves under a full moon, witness a humanoid monster and find a dead victim. 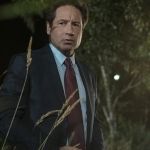 Mulder is older, wiser, and has lost his faith a bit. He wants so desperately to believe in monsters and aliens, but fool me a thousand times and shame on me. This case comes at a time where finding a real life monster could validate his entire life and career. But another hoax and he’ll keep ripping the “I want to Believe” posters off the walls for good. She smiles and responds, “I forgot how much fun these cases could be.” I know, I know. 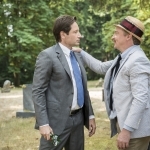 Mulder follows a lead and encounters the suspect, Rhys Darby of Flight of the Concords. He tells Mulder the whole story about how he’s a life-size horned lizard, who was bit by a human, and now becomes a full human in the moonlight! His story is a total satire of modern humanity. He needs to get a job… how he will pay his mortgage, whatever that is… has he saved enough for retirement? The story in all its fantastical nature actually manages to dissuade Mulder. 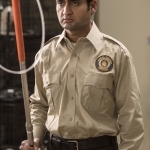 His crisis of conscience and self is key to the episode. Meanwhile, Darby is hilarious as the lizard man, and the interaction between he and Mulder are laugh out loud funny at points. Anderson is perfect as she eggs him on, all the while hoping for him to be right for his sake. The ending, I won’t spoil… is subtly genius. THESE are the episodes I fell in love with as a horror obsessed 12-year old. Monsters, lunacy, fun, that’s why The X-Files was one of my favorite shows, and such a vital part of my childhood. 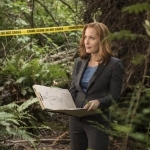 So far, after three episodes, I am loving the new and improved X-Files. The conspiracy that drove the first two is new, and that story is full of possibilities. To have the guts to dedicate an episode this early to some random monster-story is a great message to the fans. 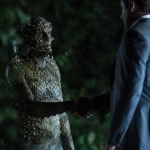 The X-Files 1.3 “Mulder and Scully Meet the Were-Monster” Monday night at 8:00 ET on FOX. Mulder snaps a picture of their monster. 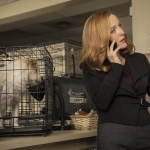 Scully and Mulder discover another victim.